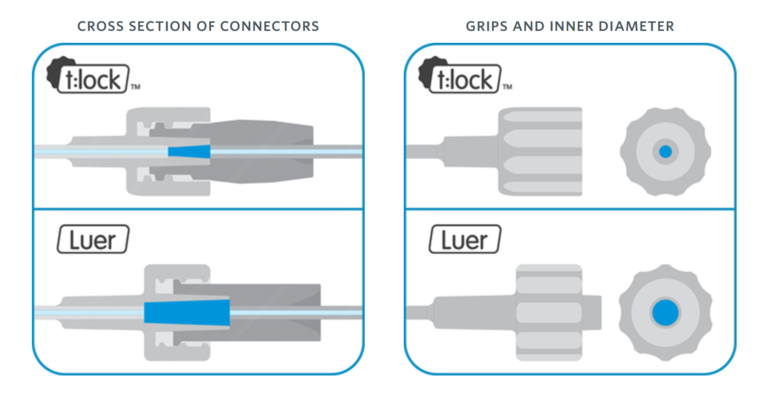 The t:lock connector is being introduced to Australia. Originally Tandem insulin pumps used the standard luer-lock connector for its infusion sets, meaning they could use the same infusion sets used by pumps such as Animas, Cozmo, Accu-Chek Combo. Then in 2017 Tandem introduced their own t:lock connector, and a whole set of new infusion sets to match. This 2017 article at Diabetes Daily discusses the differences. In 2018 AMSL introduced the Tandem t:slim X2 pump to Australia as a replacement for the Animas Vibe, but the reservoirs they used were the old luer-lock version, allowing customers to easily transition from the infusion sets they already had for their Animas Vibe pumps. Tandem AutoSoft 90 infusion set 826, 827, 828, 829 Replaces Inset II. 60cm and 110cm tubing options. Tandem AutoSoft 30 infusion set 830, 831 Replaces Inset 30. Tandem VariSoft infusion set 832, 833 Replaces Comfort and Comfort Short. Tandem TruSteel infusion set 834, 836 Replaces Contact Detach. Tandem t:lock Cartridge 722 Needed to use the above infusion sets. Note that the Tandem Luer Lock Cartridge (NDSS code 720) is still available, as are the older infusion sets. Something we don’t know yet is how long those cartridges will be available for. We knew this was going to happen eventually. We just didn’t know when. Note that when the 720 reservoirs are finally dropped, Tandem users will no longer have the option of using other sets such as the Medtronic Quick-Set, Accu-Chek Rapid-D, or the Cleo 90. EDIT: AMSL have announced that the supply of 720 reservoirs will cease in March 2019.